This picture has nothing to do with my story line except to show that Alex has an awesome scowl, and she is very happy to share it with us often and at really bad times. Hi. Thanks for sharing your day-to-day insights on raising your daughter. I've only read a little about her but she sounds like a remarkable person with a great depth to her personality. I'm following your blog on my Reader and look forward to reading more. 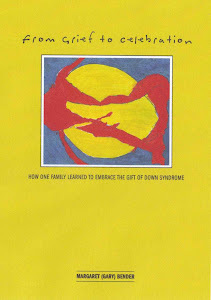 I have a son who has Down syndrome. He will be 2 in October. By the way, I've added your blog to my blogroll. I hope that's ok.
Hi there. 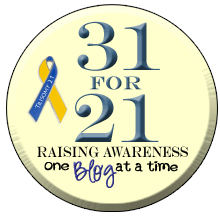 New to your blog, coming in from the T21 alliance on Facebook. My kid's only 9 months old, but I think this is a perfect reminder for me regarding how comments about, in front of, and to her might affect her in the future. Especially since we're now living in a country with very old-fashioned and rigid gender roles, Mexico, that are very different to what I grew up with in Northern Europe. Just because she's a girl she's expected to be and behave in certain ways, and so much of the comments and things that we're faced with are about the way that she looks or is supposed to look. 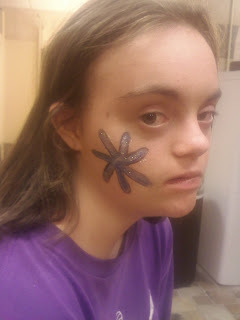 It's been driving me nuts, but now I'll be way more aware of the lasting effects on her this might have.